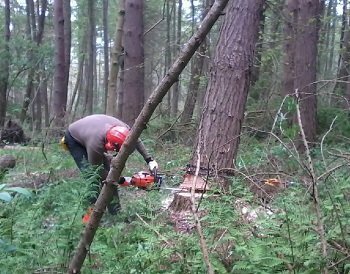 The CS30-31 is a 4 day practical course for people with little or no experience of chainsaws, who require certification in the safe use of chainsaws and the felling and processing of trees up to 380 mm, in order to comply with the Health and Safety at Work Act 1974 Regulations. This chainsaw course enables candidates to: successfully identify the required personal protective clothing; apply the Health and Safety law surrounding chainsaw operation, maintenance and performance; know how to take corrective action should a problem arise such as freeing trapped saws from logs; follow starting procedures and pre-start checks and adopt the correct stance and posture. 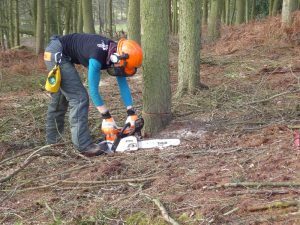 The CS30-31 will also teach you to: fell trees using wedges and felling bars; carry out at least three different types of cut; identify potential hazards and stresses and select the appropriate techniques to assess and work with timber in compression or tension. You will also be trained in how to take down hung up trees safely and in line with relevant legislation. Please be aware that this CS30-31 course has physical demands for example carrying equipment in woodland and forest environments. Please note: The felling sites are located in remote locations in commercial forests within a 50mile radius of Settle. You need to be able to drive, have a suitable vehicle for logging roads and make your own way to the felling site.